Terrible news has flooded the media and the internet in the past weeks. In the age of communication, it is harder for anyone to ignore tragedies that happen anywhere in the world. Furthermore, the inter-connectedness of our modern world, makes it seem like all events are happening right in our back yard. Yet, this week, last week and the week before, most of the world was at peace, and while it would be inhuman to ignore or to not feel compassion for the people who have suffered such terrible losses, it doesn’t serve you or the world, to sink into vibrations of fear, anger or hatred. In times like these, it is even more important that you raise your vibration and the vibration in your home and workplace. Raise your vibration by taking proper care of your body, your mind, and your emotions. By doing this, you bless yourself, your loved ones, your clients, and the world at large. By infusing your positive feelings into the human energy matrix you help raise its vibration. Your worry, anxiety, and anger do the opposite — they help lower the vibration of the human energy matrix. I recently read comments under a Facebook friend’s post, of people saying they have been “unfriending” people left and right because of their posts with which they did not agree. Do not allow the craziness and violent acts of a small percentage of people in the world to ruin your friendships, to alloy your relations with your co-workers, or to depress you. If you allow these things to happen, they win. Though this may be hard to believe, the world is getting better and better, and violent acts, though much more broadcast than in the past, are actually on the decline. The same is true for hunger, illness and poverty. If you don’t believe me, search for this term online: “how the world is getting better” and you will find some amazing articles with data that shows this to be true. In times like these, your well being, your happiness, the wonderful moments you share with your family and friends, are your gift to the world. 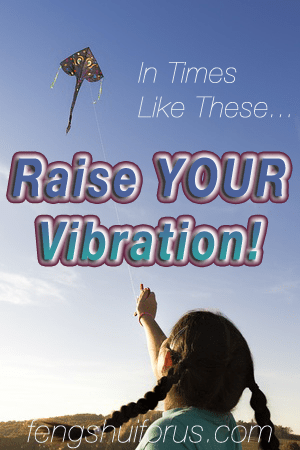 This meme I created last year to go with an article on raising your vibration has been re-pinned on Pinterest over 1600 times. Check it out here. It is a really good start to improve your vibrational level, and at the bottom of the article you will find some recommendations on healing practices that may be helpful to you. Click here to get there. Click this image to see it larger in the original article. feng shui vibration, raise your vibration. Bookmark.